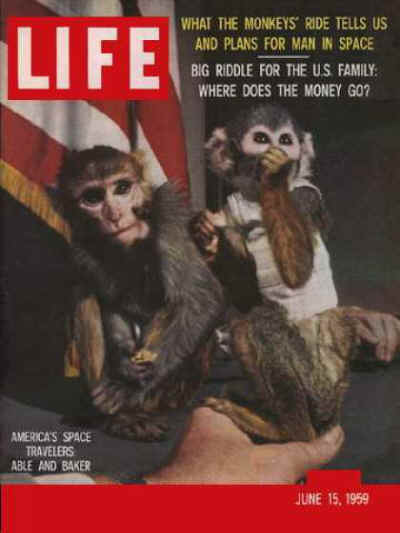 Able, a seven-pound female rhesus monkey, and Baker, a one-pound female squirrel monkey were launched into space on May 28, 1959 in the nose cone of JUPITER Missile AM-18. Some of this information was provided by Joseph Guion CDR US Navy Retired who was the commanding officer of USS KIOWA, the ship that recovered the monkeys. Thank you for his input to make this historically correct. They reached an altitude of 300 miles and a distance of 1500 miles while traveling at speeds over 10,000 miles per hour on their brief trip into space. They successfully withstood forces 38 times the normal pull of gravity on earth and were weightless for approximately 9 minutes. This mission marked the first successful recovery of living beings after their return from space. 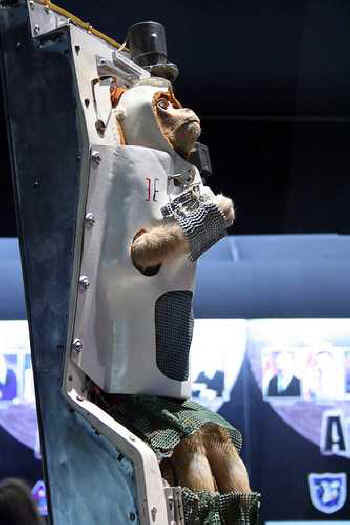 Able and Baker were unharmed after their 15 minute space flight. But a couple of days later, Able died from effects of anesthesia given for removal of electrodes they had implanted. Baker survived a similar operation. Get this. 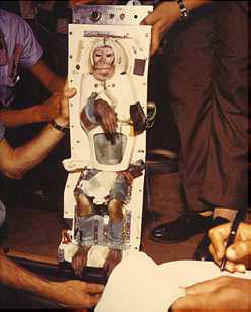 They did an autopsy which revealed Able's death was not a result of the space flight. Excuuuse me. She wasn't born with those electrodes in her body!